Maplewood High School students Destiny Davis and Jamya Whitmore gave up their cellphones for 24 hours as part of a "digital cleanse" challenge. Maplewood students rush to send messages before giving up their phones for a day. Before giving up technology, students wrote about their motivations and expectations, as well as their intense connections with their cellphones. 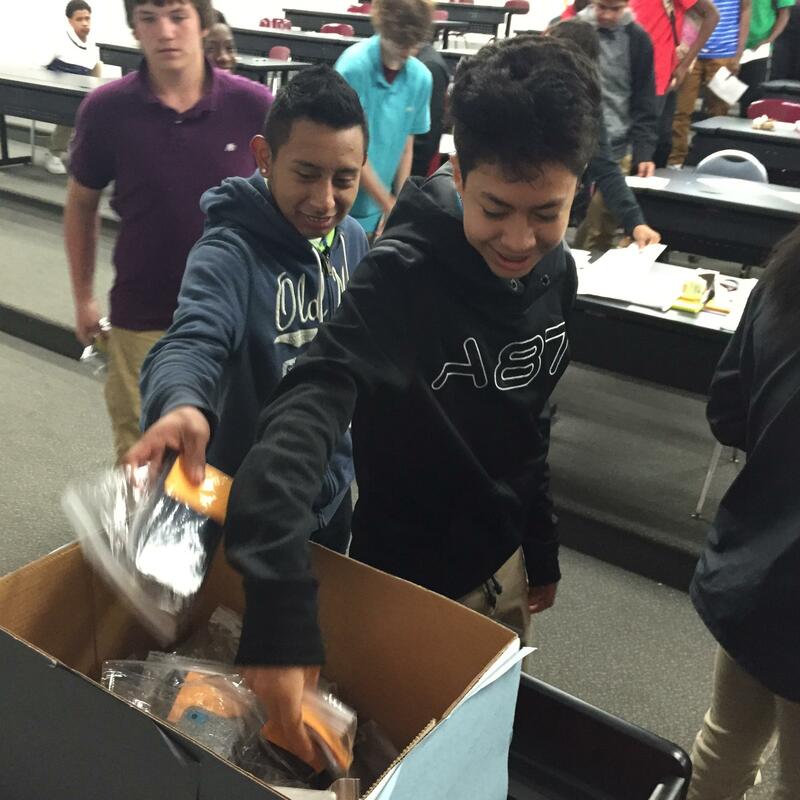 The students bagged their phones and they were locked away overnight. Before being reunited with their phones, students had to reflect on their 24 unplugged hours. The “digital cleanse” has become a popular challenge at colleges, churches, and fitness clubs, where groups organize specific days to disconnect from technology. Now, 42 freshmen students at Nashville’s Maplewood High School can say they’ve tested themselves after unplugging from their cellphones for 24 hours. 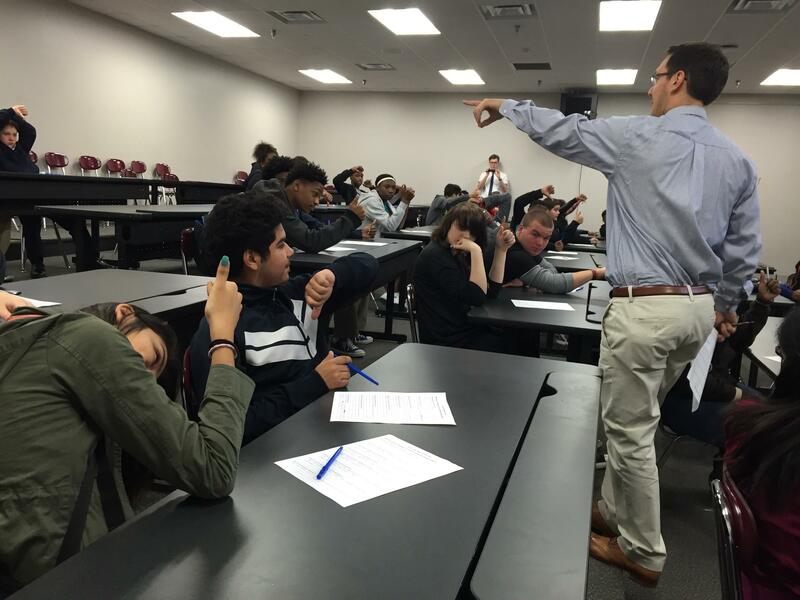 Maplewood teacher Jarred Amato surveys his freshmen students about living without technology for a day. Amato, still in his 20s, also counts himself and plenty of other adults among smartphone addicts. He can relate to their awesome power. But he at least remembers a world before they were in every pocket. So went Amato’s thinking as he prepared for the one-day event that he titled #PanthersUnplugged. He said he wanted to give his students a chance to reclaim control over their habits, if even for a day. With a student film crew documenting the day, Amato and Cook began by probing the students about how they thought they’d fare and how they’d spend their time while avoiding technology. BEFORE: Hear teacher Jarred Amato introduce students to the unplugged challenge. Freshman student Angel Carroll unplugged from her phone to see how her personality would change. The answer? A resounding, “yes,” from a few students. They wrote answers to a set of questions and each wrote the single most important reason that they were choosing to unplug. BEFORE: Hear students Angel Carroll and Omeka Southerland talk before unplugging. AFTER: Hear Angel and Omeka on the morning they got their phones back. As the clock ticked toward the moment of separation, students Destiny Davis and Jamya Whitmore clutched their phones. Davis said the good part would be talking with her family more. The bad part? The same. When Amato gave the 5-minute warning, panic rippled through the room. The girls had to send their final Facebook messages and Snapchats. The students put their phones in Ziploc bags — Amato and Cook too. Then the teachers led the group in the #PanthersUnplugged pledge. “As a Maplewood freshman, I recognize that many teenagers have become addicted to technology and social media. We are spending more time communicating with our screens than with each other,” the pledge began. Hear the full #PanthersUnplugged pledge. 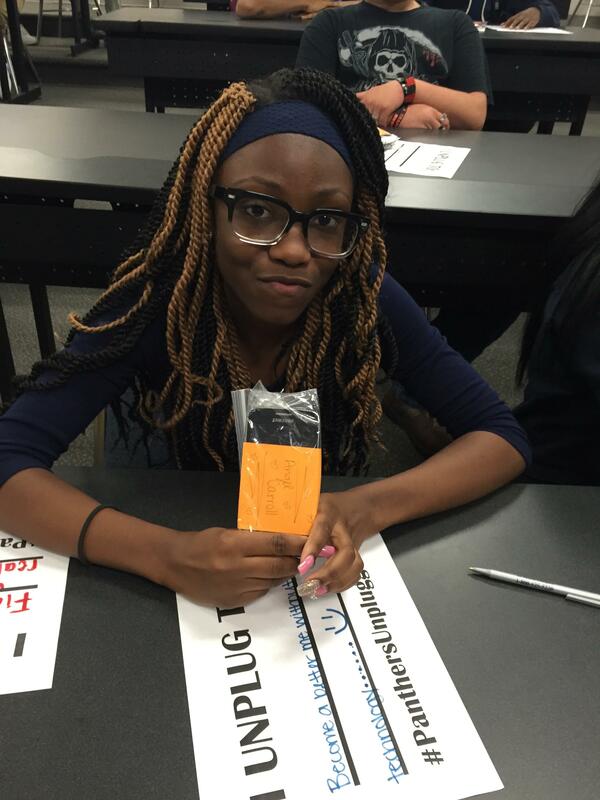 Maplewood High School students drop off their cellphones at the start of a 24-hour "unplugged" challenge. Then, single file, they stacked their phones in a cardboard box. Some even kissed them goodbye. The phones would spend the night locked in a cabinet. But before Amato could even deliver them, he’d already caught himself reaching into his empty pocket because of a phantom vibration. Fast forward to the next morning, Amato sensed something different in his classroom. To milk the moment, he asked the students a batch of follow-up questions while the phones sat just out of reach. 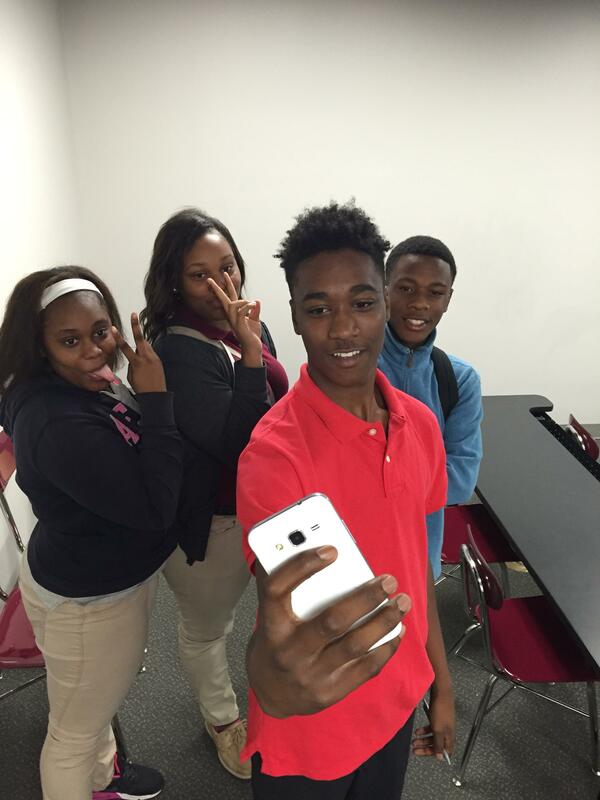 Four Maplewood High School freshmen pose for their last selfie before giving up their phones for 24 hours. About two-thirds said unplugging was easier than expected — and one student opted to keep her phone off for another day. Several played outside for the first time in awhile. Others played cards with their families for the first time in years. And almost universally, those who unplugged went to bed earlier, although Destiny and Jamya said that waking up without a phone was disorienting. AFTER: Hear teacher Jarred Amato discuss his night while unplugged from technology. And then at long last, on Amato’s count of three, they tore the bags open, with woots and a fresh round of cellphone kisses. The first order of business: Count up the missed messages, “likes,” Snapchats, and Kiks. Jamya had at least 15, and Destiny immediately began exclaiming about the gossip she’d missed overnight on Facebook. It turns out those phantom vibrations they’d been feeling for a day — messages were coming in over that time. And they were still there, waiting to be read, after everyone had unplugged to live a little. There’s a stack of research that suggests all the educational innovation in the world still doesn’t hold a candle to an awesome teacher. And that's the driving force behind an experiment at three low-performing Nashville schools to broaden the impact and boost the pay of superstar teachers. The latest controversy over what Tennessee schoolchildren are taught about Islam reached the state's Textbook Commission Friday. In recent weeks, parents and legislators have pushed to change the curriculum. Drivers have been lured away by higher hourly pay and signing bonuses in the thousands of dollars at trucking companies and private bus lines. District officials acknowledge they have not remained competitive with private companies. Officials say that is their “misstep” — one they intend to correct, though not necessarily with a straight raise in hourly pay, which currently ranges from $13/hr to nearly $20/hr.